Cameras are one of the best ways to identify and catch burglars—especially with 52% of all residential burglaries taking place during the day when nobody’s home. ADT offers a variety of home security cameras to protect your home, but how exactly do they work? Do they require monitoring? Is there an additional cost to my home security system if I have a security camera? 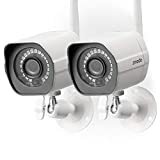 Requires use of the ADT Pulse wireless network using the Camera Assistant: With the ADT pulse wireless network system, you are required to use only ADT cameras. You cannot install your own off-market video camera and have it be compatible with the system. If you choose a video surveillance product with ADT, you must subscribe to the video monitoring package for an additional cost. While ADT video offers multiple benefits, but what if you want a system that you can hear what’s going on and even talk back? Then check out what Protect America has to offer. You might be wondering, Can’t I just buy a video surveillance camera and monitor it myself? Can’t I save money this way? Authorities are not automatically dispatched by anyone to your home. It is up to you to take the next course of action to protect your home. You can get substantial monthly savings on your insurance if you have a monitored system. Oftentimes this helps offset the monthly monitoring fee. Regardless of the specific product or company you choose, what is important to look for in a video surveillance camera? Ready to protect your family? Give the professionals at Protect America a call now for your free quote! With over 25 years of experience, you can be sure that Protect America has your best interest in mind!